32 MMS March 2017 mmsonline.com DECIDING FACTORS A Focus on Data-Driven Manufacturing CO NTR I BUTO R D O M E N I C L A N Z I LLOT TA , Fac to r y W i z M o n i to r i n g ( f ac to r y w i z .c o m) Data That Helps HR A s a supplier of machine monitoring software, we find that customers are primarily preoc- cupied with concerns over machine performance and utilization. This is why overall equipment ef fectivene ss (OEE ) is a popular measure of shopfloor activities. Most dashboards showing production results include OEE ratings, at least as an option. 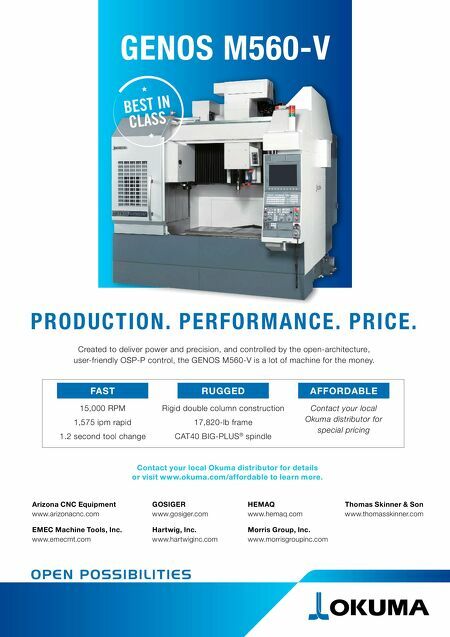 However, the productivity (and profitability) of a machining operation has as much to do with human behavior, especially how well machine operators are per forming their duties to keep machines running and jobs on schedule. The data from some machine monitoring sys- tems can also help a machining company enhance the contribution of shopfloor personnel in the productivity equation. In fact, this data can be a valuable tool for many human resource (HR) func- tions such as conducting employee performance reviews, managing incentive programs, setting goals and identifying training needs. Just as data gathered by a computer network from connected machines can lead to better decisions about a manufacturing process when that data is analyzed and reported effectively, this data can also lead to better decisions about engaging and motivating a workforce. Implementing a machine monitoring system makes performance measurable, objective and visible. The same characteristics apply to the study of operator performance—its basis can now be measurable, objective and visible. 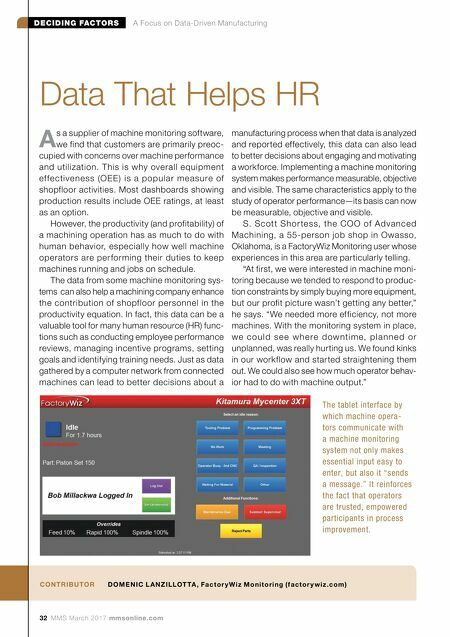 S. Scot t Shor te ss, the COO of Advanced Machining, a 55-person job shop in Owasso, Oklahoma, is a FactoryWiz Monitoring user whose experiences in this area are particularly telling. "At first, we were interested in machine moni- toring because we tended to respond to produc- tion constraints by simply buying more equipment, but our profit picture wasn't getting any better," he says. "We needed more efficiency, not more machines. With the monitoring system in place, we c o u l d s e e w h e re d ow n ti m e, p l a n n e d o r unplanned, was really hurting us. We found kinks in our workflow and started straightening them out. We could also see how much operator behav- ior had to do with machine output." The tablet interface by which machine opera- tors communicate with a machine monitoring system not only makes essential input easy to enter, but also it "sends a message." It reinforces the fact that operators are trusted, empowered participants in process improvement.